In the latest BIS Quarterly Review, the BIS points a finger at the ECB for rising Target2 imbalances. I strongly disagree that any of this is “benign” unless and until someone can tell me precisely how Italy, Spain, Greece, etc., are supposed to pay back the claims. TARGET2 (T2) balances are again on the rise. Since early 2015, the T2 balances of euro area national central banks (NCBs) have risen steadily, in some cases exceeding the levels seen during the sovereign debt crisis (Graph A, left-hand panel). 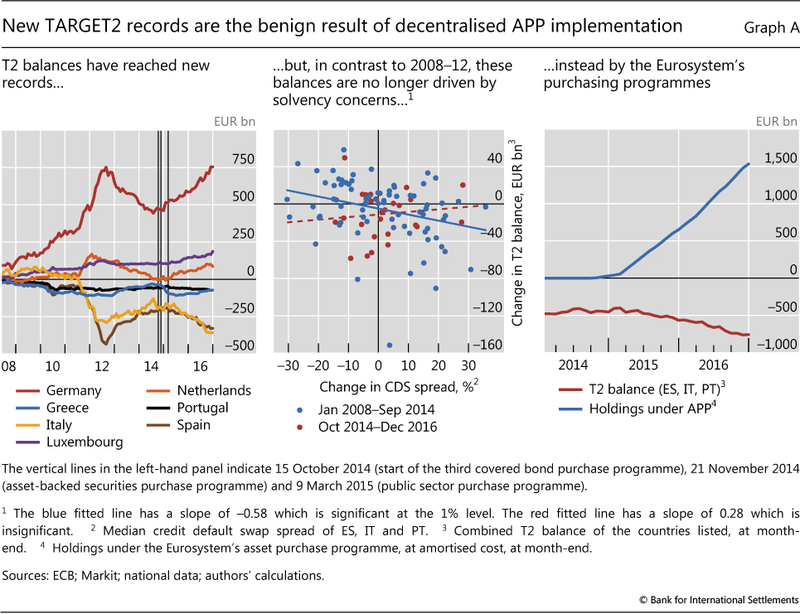 However, unlike then, record T2 balances should be viewed as a benign by-product of the decentralized implementation of the asset purchase program (APP) [ECB’s QE] rather than as a sign of renewed capital flight. Because liquidity operations in the Eurosystem are decentralised, claims or liabilities of NCBs vis-à-vis the ECB can arise. Market operations are to a large extent implemented by the Eurosystem’s NCBs rather than by the ECB. When an NCB disburses liquidity directly to commercial banks, it keeps the claims on those commercial banks on its own balance sheet. But the funds may end up in another commercial bank’s account with a different NCB. As a consequence, the liquidity-providing NCB has a liability vis-à-vis the ECB, while the NCB receiving the reserves holds a claim on the ECB. The net of such claims and liabilities is referred to as a “TARGET2 balance” because it is recorded as such in the main payment settlement system of the euro area, the second edition of the Trans-European Automated Real-time Gross Settlement Express Transfer System. In the period leading up to mid-2012, T2 balances grew strongly (Graph A, left-hand panel) due to intra-euro area capital flight. At the time, sovereign market strains spiked and redenomination risk came to the fore in parts of the euro area. Private capital fled from Ireland, Italy, Greece, Portugal and Spain into markets perceived to be safer, such as Germany, Luxembourg and the Netherlands. Indeed, during that period, the rise in T2 balances seemed related to concerns about sovereign risk. The blue dots in the centre panel of Graph A show the close relationship between the sovereign credit default swap (CDS) spreads of Italy, Portugal and Spain and the evolution of their combined T2 balance from January 2008 to September 2014. Whenever the CDS spreads of those economies rose, the associated private capital outflows increased their T2 deficit. When the CDS spreads decreased after confidence in the euro area was restored in mid-2012, the capital outflows partly reversed, and T2 deficits dwindled. In contrast, the current rise seems unrelated to concerns about the sustainability of public debt in the euro area. The red dots in the centre panel of Graph A show that, between October 2014 and December 2016, there was no relationship between the sovereign CDS spreads of Italy, Portugal and Spain and the evolution of their combined T2 balance. The current rise in T2 imbalances seems to have a different cause: the Eurosystem’s APP, which mechanically affects the evolution of these balances. Many APP purchases are conducted by NCBs via banks located in other countries. 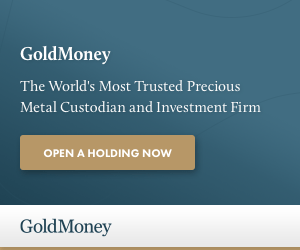 One example is where the Bank of Italy, as part of its implementation of the APP, buys securities from a London-based bank that connects to the T2 system via a correspondent bank located in Germany. The purchase amount is credited to the account of the German correspondent bank at the Deutsche Bundesbank, thus increasing the T2 surplus of the Bundesbank. Similarly, the Bank of Italy’s T2 deficit widens. This mechanical impact of the APP on T2 imbalances is also confirmed by the evolution of T2 balances vis-à-vis Greece. The country’s sovereign bonds are not eligible for the APP, and consequently the Greek T2 deficit has actually been more or less stable during recent months (Graph A, left-hand panel). In 2012, the BIS had a different Target2 Conclusion. The debate over the appropriate interpretation of the TARGET2 balances has involved the analytic question of whether such balances are best associated with ongoing current account balances or whether they reflect a capital account reversal that is motivated by credit concerns. We recognize both but our analysis of the first half of 2012 data emphasises the importance of positioning against redenomination risk. The European Economic Advisory Group (2012, p 62) states, “In the past interest rates diverged due to the fear of depreciation; now they do so because of the fear of default.” Our identification of capital flows as motivated by redenomination risk implies that interest rates diverged into 2012 on fears of depreciation, or hopes of appreciation. Flows of funds suggest that 2012’s last leg up in TARGET2 balances reflected something more akin to a currency attack than current account financing or credit reversal. Nothing has changed, except the transfer mechanism. The ECB is now aiding and abetting capital flight. Here is a simple test question: What would happen to Italian bond yields if Draghi halted QE asset purchases? If bonds yields would rise, then the ECB is acting to prevent either interest rate risk or default risk. But what is interest rate risk if ultimately not default risk? German debt has a lower yield than Greek debt and Italian debt for one reason only: default risk. Italy is on ECB life support. Should Draghi halt QE asset purchases, demand for Italian bonds will plunge. For discussion, please see Draghi’s Dilemma: Eurozone Inflation Hits 2% with Italy on Bond Life Support. Zerohedge reported BIS Admits TARGET2 Is A Stealth Bailout Of Europe’s Periphery. That headline isn’t accurate but the idea is sound. The ECB is bailing out peripheral countries via indirect means. But whether or not capital flight is direct or indirect, the ECB’s mask does not change reality. I emailed the ECB a couple of questions on Target2 and found their answers unsatisfactory. For details, please see Fuse is Lit! Target2 Imbalances Hit Crisis Levels: An Email Exchange With the ECB Over Target2. I can tell you Mish: They won’t. Simple default will be slathered in bureaucratic gobbledegook as usual but the short answer is, they get bailed out once more and the EU limps to its grave. Bottom line Mish nothing has changed as the ECB and for the most part our Fed continues to buy Government debt. It will indeed implode in the future. Glad I live in the country. When things in Europe finally hit the wall (again) … will the Federal Reserve toss out a multi hundred $billion currency swap to the ECB (again) … and risk enormous loss for US taxpayers if Federal Reserve has to eat swap loss if euro goes under? No doubt the reason you proffer is true, but for years I’ve felt that the ultra low rates in Germany due in part to bet on euro break up. Bettors, er, investors bought German debt knowing that if break up occurred German debt would be repriced in deutsche marks. Currency play. You are fully correct. People are buying German assets (bonds and stocks), because they expect to get the D-mark in return if the euro goes belly up. Not only is Germany profiting most of the current euro system, it is the same with their assets. For the same reason (euro problems) people are parking money in the U.S. stock market. All very plausible, except …. Germany would be wearing a Target 2 balance so large it would likely need to be monetized (in the event of a break-up)…. thereby rendering the new D-Mark much weaker than it would otherwise have been. Said another way, Target 2 has effectively diluted both trans-national claims and liabilities such that the cost of this back-door German bailout will be baked into the D-mark valuation, ex post facto. German ST rates have been negative for some time now and I think a ‘bet’ on the break up of the Euro is way too early: as much as I believe the Euro will break up, I think that day is still many years away and that the opportunity cost of having that bet on this early is too high, particularly given the risks of higher inflation in the interim. It’s all a necessity to force integration. It’s the cost of creating a unified euro under one fiscal authority. No way back for the peripheral euro states. If it is APP funds flowing to holders of the assets (in stronger countries) it is in fact, in Target2 terms, returning (as in bailing out) the capital that was transferred to the weaker countries by the financial institutions of stronger countries. In other words it is Target2 returning to its real value as sovereign debt is taken out of the equation and the NCB debt resulting in its place registering in Target2. So before southern sovereigns owed northern banks who owned their debt, now southern NCBs owe northern NCBs. The capital movements had already occurred outside of T2 but were not visible, or decreased in the T2 account, as they went into purchases of southern debt. I know at least some capital flight was sovereigns buying back their own debt originally, after the ‘whatever it takes’ I expect northern institutions went back into holding weaker sovereign debt, only to be able to offload it now onto the ECB. This latest disentangling of accounts into/under ECB when rates are already very low to justify further liquidity is possibly a decision to render them clearly into national terms in case the Euro gets ‘disrupted’ along national lines. There are profits for some in this the whole way through. The dark red line in the first graph is a proxy for the odds on Germany owning all of EU. In the 1930s Germany made an alliance with Italy, AXIS. Through this Germany effectively took over Italy. Germany then used military means to take over the Netherlands, Belgium, France, Poland, Czechoslovakia, Greece, parts of Jugoslavia and then tried to invade England, Norway and Russia. It failed to invade England and Russia. By buying the debt of the Eurozone countries, Germany has almost achieved the same goal. The Netherlands remains financially independent and Belgium doesn’t count. France may have realised it is next and this is why Le Pen may get support from surprising sources. The US is well poised through the IMF to pick up the pieces and may compete with the Chinese led alternative to do so. Let’s watch this play out. Trump has shown us that the real world can be more entertaining than TV shows, Will the EU and Eurozone do the same? I think Trump sees things in a similar view since he is trying to improve relations with Russia, just as was needed to end WW2 in Europe. Indeed you may be correct; he seems to have a number of good ideas, if only he would get on with them and stop entertaining those whose find America’s embarrassment amusing.